To Cite: Daneshian Z, Ramezani Tehrani F, Zarkesh M, Norooz Zadeh M, Mahdian R, et al. Antimullerian Hormone and Its Receptor Gene Expression in Prenatally Androgenized Female Rats, Int J Endocrinol Metab. 2015 ; 13(1):e19511. doi: 10.5812/ijem.19511. Background: Anti-mullerian hormone (AMH) levels reflect the number of small antral follicles in ovaries and expression changes of AMH and its receptor are suspected to be involved in the pathogenesis of polycystic ovary syndrome (PCOS). Objectives: The aim of this study was to evaluate gene expression of AMH and its receptor in immature and adult rats prenatally exposed to androgen excess. Materials and Methods: Six pregnant Wistar rats in the experimental group were treated by subcutaneous injection of 5 mg free testosterone on day 20 of pregnancy, while controls (n = 6) received only 500 mL of solvent. Female pups of each mother were randomly divided into three groups as day 0 (newborn), 10-day old and days 75-85 (adult). RNAs were extracted from ovarian tissues and relative expression levels for AMH and its receptor genes were measured using TaqMan Real-Time PCR. Serum AMH and testosterone levels were measured using ELISA method. Results: Relative AMH expression decreased in newborns, 10-day olds and adults (0.806, 0.443 and 0.809 fold, respectively). 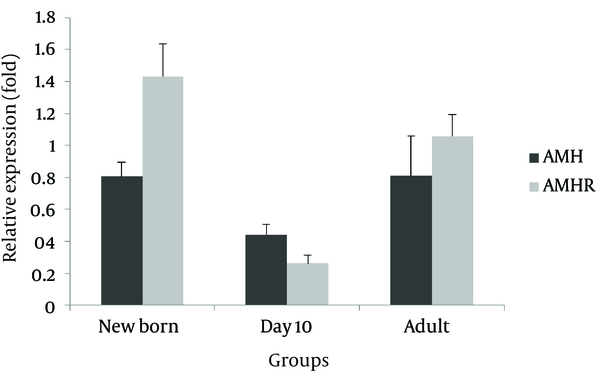 AMHR expression was higher in newborns and adults (1.432 and 1.057 fold, respectively), while it decreased by 0.263 fold in 10-day olds, although none of them were significant (P > 0.05). In addition, AMH levels were consistent with the results of gene expression. Testosterone hormone levels from 10 day-olds to adults were significantly increased in both study groups (P = 0.016). Conclusions: While AMH receptor expression was higher in experimental rats, their serum concentrations of AMH were decreased. Further researches with greater sample sizes and measurement of bioactive forms of hormones are recommended to confirm the findings of this study. Polycystic ovary syndrome (PCOS) characterized by menstrual disturbances and clinical and biochemical manifestations of hyperandrogenism, is the most common gynecological endocrinopathy in women of reproductive age. Familial clustering and studies on the prevalence of syndrome in twins suggest an interaction of genetic and environmental factors in the pathogenesis of PCOS (1, 2). Development of animal models has been useful to identify the etiology of PCOS. Emerging research findings from animals mentioned fetal androgen excess as a main environmental factor, which could be the origin of the syndrome (3). Experimental induction of androgen excess during prenatal life in female rhesus monkeys, ewes, and rats has been shown to exert appropriate PCOS-like phenotypes (4-6). Among these, rodent models which display reproductive and metabolic disturbances associated with the syndrome, are most cost-effective ones to study ovarian dysfunction and PCOS (7, 8). Fetal exposure to androgen excess could promote changes in gene expression in differentiating tissues, leading to development of PCOS during adulthood (9-11). Over the past decade many candidate genes from pathways assumed to be involved in the etiology of PCOS, have been investigated, but none of them were found to play a crucial role in PCOS pathogenesis and the genetic pathway of the syndrome has remained unknown (12). Based on pathophysiologic mechanisms, candidate genes can be categorized as follows: those involved in androgen biosynthesis and metabolism, those involved in insulin resistance, those encoding inflammatory cytokines and those involved in folliculogenesis. Among those markers involved in folliculogenesis, antimullerian hormone (AMH) is one of the key mediators of early follicular differentiation. It has been shown that women with PCOS have two to three fold higher AMH levels compared to their normal counterparts (13). However, data revealed controversial results on AMH concentration and gene expression in PCOS animal models. In prenatally androgenized sheep findings were similar to PCOS women and AMH expression showed reduction in granulosa cells of preantral follicles and increase in antral follicles compared to age-matched adult controls (14). Wistar rats androgenization, whether pre- or post-natal led to fewer AMH-positive follicles in ovaries of adult females (15). The aim of the current study was to examine AMH and its receptor gene expression in ovaries in rats with prenatally testosterone induced PCOS compared to the control group. Our study was the first one to investigate AMH (and its receptor) gene expression in newborn, 10- day old and adult rats. Animals and treatments: All used procedures were approved by the local ethics committee of Research Institute for Endocrine Sciences (RIES) of Shahid Beheshti University of Medical Sciences (Tehran, Iran). Adult female Wistar rats (n = 12, body weight 170-190 grams) were supplied by the animal center of the RIES. Each virgin female rat was housed in a separate polypropylene cage (43 cm × 30 cm × 15 cm) with a fertile male of the same strain (1 female with 1 male) for 48 hours in an environmentally controlled room (temperature 22 ± 3°C, relative humidity 24 ± 6% with 12-h light/dark cycles, light period beginning at 07:00 A.M). Animals had free access to Purina rat chow and water. Twelve pregnant rats were randomly divided into experimental and control groups (n = 6 each). Presence of a vaginal plug was designated as the first day of pregnancy. On the 20th day of pregnancy, pregnant rats in the experimental group were treated with subcutaneous injection of 5 mg free testosterone (T-1500; Sigma, Germany) dissolved in 500 mL sesame oil and benzyl benzoate (B6630, Sigma, Germany), while the control group received only 500 mL of solvent (sesame oil and benzyl benzoate). Time and dosage of treatment were determined based on previous published data (16-18). Females were separated from males before maturation age. Female pups of each mother were randomly divided into three groups and killed at three stages of life (day 0 (newborn), 10-day old and day 75-85 (adult)). Hormonal and histological changes of adult offspring confirmed PCOS by exhibition of hyperandrogenemia, ovarian cysts and reduction of ovulation. Details of these manifestations in experimental group compared to their controls were described previously by Ramezani Tehrani et al. (16). They reported that testosterone and LH levels, LH/FSH ratio and the number of preantral and antral follicles in ovaries were increased in prenatally androgenized adult female offspring. In contrast, the number of preovulatory follicles and corpora lutea were decreased in these animals. Moreover, cystic follicles were observed in their ovaries. Blood and tissue collection and hormones assay: At the time of killing, collected blood samples were centrifuged for five minutes (3000 × g at 4°C) and plasma was stored at -80°C for further measurements. Ovarian tissue samples were collected, dipped in liquid nitrogen and stored at −80°C. Plasma AMH and testosterone levels were measured using rat AMH and testosterone ELISA kit (CUSABIO BIOTECH CO, LTD, Japan). Assay sensitivity was 0.6 ng/mL for AMH and 0.06 ng/mL for testosterone. RNA extraction and real-time quantitative PCR: Total RNA was extracted from ovarian tissues using the RNeasy kit (Qiagen, Germany). RNA quantity and purity were measured using the NanoDrop 1000 (Thermo Scientific, Waltham, and Mass). AMH and AMHR2 gene expression were quantitatively assessed by TaqMan real-time polymerase chain reaction (qRT-PCR). The sequences of the primers and probes are shown in Table 1. The reactions were performed in 25 μL volumes containing 12.5 μL Probe-PCR Master Mix (Qiagen, Germany), 0.25 µL RT-mix, 0.8 μL forward primer, 0.8 μL reverse primer, 0.6 µL probe, 8.05 μL RNase- free water, and 2 μL of the total RNA. PCR was performed using the Rotor-Gene 6000 real-time PCR machine (Corbett Research, Sydney, Australia) with initial denaturation (5 minutes at 95°C) and then a one-step amplification program (5 minutes at 95°C followed by 45 seconds at 60°C) was repeated 40 times. Real-Time quantification was monitored by measuring the fluorescence activity. All samples were run in duplicate. The relative amount of mRNA in each sample was calculated based on its threshold cycle (Ct) compared to the Ct of the housekeeping gene (β-actin). Relative expression in samples from treated animals and the controls was compared by relative expression analysis using the 2-△△Ct method as follows: 2-[(Ct target gene – Ct reference gene) Treatment - (Ct target gene -Ct reference gene) Control] (19). Statistical analysis was performed using SPSS 15.0 software (Chicago, IL, USA). Kolmogorov–Smirnov test was used to determine normal distribution of data. All continuous data were expressed as mean ± standard deviation. Logarithmic transformation was performed to normalize the distributions. The means of experimental and controls were compared using a two-tailed unpaired sample t-test. One-way analysis of variance (ANOVA) was used to test differences of means between the groups. Quantitative RT-PCR results were assessed using Rest 2009 Software (Qiagen, Hilden, Germany). Probability values below 0.05 were considered statistically signiﬁcant. Female pups of each mother (43 experimental and 34 controls) were randomly divided into three groups as newborn (n = 26), 10-day old (n = 19) and adult (n = 32). Measurement of hormones was performed in all female offspring, while gene expression was only evaluated in offspring of those mothers which had female offspring in all age groups (newborn (n = 10), 10-day old (n = 10) and adult (n = 12)). Plasma total AMH levels: Hormone levels of AMH and testosterone are shown in Table 2. The experimental group had lower, but not significant AMH levels in newborns, 10-day-olds and adults compared to controls; however, mean testosterone hormone levels in the experimental group were higher than controls in these three groups. A decrease in AMH concentration was observed in 10 day-olds compared to newborns in both the case and control groups. Furthermore, AMH level was higher in adults, compared to the 10 day-old and newborns in each group (P < 0.001). Compared to the controls, testosterone level was increased, not significantly, in all the three age groups (P > 0.05); however, a significant positive trend was found from 10 day-olds to adults in cases and controls within the groups (P < 0.001). AMH and AMHR mRNA expression level in ovary: compared to the control group, a relative non-significant decrease was observed for AMH gene expression in all three experimental age groups (newborns 0.806, 10 day-olds 0.443, and adults 0.809 fold) (Figure 1). Moreover, AMHR mRNA relative expression was higher in newborns and adults and lower in 10-day old experimental group (1.432, 1.057 and 0.263 fold, respectively), with none of the differences were statistically significant. In this study, we aimed to examine variation of AMH and its receptor gene expression in rats with intrauterine exposure to testosterone excess and exhibited PCOS manifestations during adulthood. Our results demonstrated that contrary to PCOS in women, intrauterine exposure to testosterone excess, reduced biosynthesis and circulating AMH concentrations in rats. Our data furthermore confirmed that AMH receptor expression and testosterone levels were higher in rat PCOS models than controls. The pathogenesis of PCOS is not clear; however, growing evidence reveals a strong interaction of genetic components and environmental factors in disease development. Several genes have been investigated with different results. There is no consensus on the genetic pathway of this syndrome. One of the indices in PCOS women is elevated AMH level, which represents an increase in the number of growing follicles and associated with severity of the disease (20). However, animal studies on PCOS and AMH had different results; for instance, in ewes treated with androgens before birth, AMH production was increased by antral follicles in adult animals (14); in contrast pre- and postnatally androgenized Wistar rats had fewer numbers of follicles that produced AMH, and also greater numbers of follicles, which had been recruited and subsequently undergone atresia compared to controls. Furthermore, the number of aromatase-positive antral follicles was greater in these postnatal treated rats compared to controls (15). Similar results of other studies reported in Wistar rats demonstrated a decreased AMH expression in experimental group, which could be due to decreased proliferation of granulosa cells in response to prenatal exposure to increased amounts of testosterone. AMH serum concentrations observed in our study were appropriate based on the results of its gene expression. In the present study, we observed a non-significant increase in serum testosterone levels in the experimental group. However, the difference between 10-day-old and adult rats of the both groups was significant. In agreement with the present study, there were no significant differences for serum testosterone levels in adulthood in Sprague-Dawley rats that received testosterone daily on embryonic days 16-19 compared to the controls (6). However Wang et al. treated pregnant rats with epiandrosterone sulfoconjugate (DHEAS) and found a significant difference in serum testosterone levels in female offspring of the experimental group (21). These controversial observations could be partly explained by lack of measurement of free testosterone, which is physiologically active and mediates the biological action of hormone in the target tissues of both genders (22). The major limitation of our study was its small sample size, which limited our power to assess the differences. However, to the best of our knowledge, this was the first study investigating AMH and its receptor gene expression in rats with prenatally testosterone-induced PCOS. Furthermore, for the first time we examined AMH and AMHR gene expression in immature rats. In conclusion, AMH receptor expression was higher in rats prenatally exposed to androgen, but serum concentration of AMH was decreased in these rats, contrary to those observed in PCOS women. Further researches with greater sample size and measurement of bioactive forms of hormones are recommended to confirm the findings of this study. Our special thanks to the research lab personnel of the Research Institute for Endocrine Sciences for their contribution on hormonal assays. We would like to acknowledge Ms. Niloofar Shiva for critical language editing of English grammar and syntax of the manuscript. Authors’ Contributions: Study concept and design: Dr. Azita Zadeh Vakili and Dr. Fahimeh Ramezani Tehrani; acquisition of data: Zahra Daneshian and Mahsa Norooz Zadeh; analysis and interpretation of data: Dr. Azita Zadeh Vakili, Zahra Daneshian, Maryam Zarkesh and Dr. Reza Mahdian; drafting of the manuscript: All authors; critical revision of the manuscript for important intellectual content: Dr. Azita Zadeh Vakili and Dr. Fahimeh Ramezani Tehrani; statistical analysis: Maryam Zarkesh and Zahra Daneshian; administrative, technical and material support: Dr. Azita Zadeh Vakili; study supervision: Dr. Azita Zadeh Vakili. Funding/Support: This study was financially supported by the Research Institute for Endocrine Sciences of Shahid Beheshti University of Medical Sciences, Tehran, Iran.